Where the excitement is building! Online orders to all USA addresses. Phone orders to all USA addresses. See checkout for shipping options. Prop Adapters Collet & Etc. Wheels Gear Axles & Etc. Whats New - Adhesives/CA/Epoxy - Aliphetic Resin & PVA - CA (Cyanoacrylate) - Canopy Specific - Contact - Epoxy - Epoxy Finishing Resin - Epoxy Kits Resins & Hrdnr - Filler - Foam Safe - Hot Glue All - Plastics Specific - Solvent Based Glues - Thead Lockers - Tips/Cups/Mixing/Etc - Tote Kits & Glue Combos - Batteries & Parts - Alkaline/Button/Primary - NiCad Single Cells - NiMH Single Cells - A123/LithiumWerks Cells/Packs - Receiver LIFE Packs - Receiver NiMH Packs - Receiver NiCad Packs - Lead Acid and Gel Cells - Lithium Poly Packs/Cells - Lipo Raw Cells - Lipo TX & RX Packs - Lipos Up To 500mAh - Lipos 501-1000mAh - Lipos 1001 to 1800mAh - Lipos 1801 to 3700mah - Lipos 3701 & Up - Balance Extensions - Balance Harness Connectors - Cell Holders - Elec Mtr Packs NiMH/NiCd - Heat Shrink - Insulators Fish-Tape-Caps - Tabs & Bars - Tx Packs NiMH & NiCd - Wire 2 Pole - Charge Cords & Testers - Balance Adapter Boards - Balance Adapters - Balance Extensions - Balance Plugs & Pigtails - Battery Analyzer - Charge Cords Custom & Precision - Charge Cords Electric Flight - Charge Cords Misc - Charge Cords Receiver - Charge Cords Transmitter - LIPO & LIFE Balancers - Power DC Extensions & Strips - Power DC Input Plugs - Power Supplies (12V from 110V) - Safety Charge Containers - Voltmeters-ESV - Chargers - Accessories - Astro Flight - evoJet Orbit Accessories - Lead Acid / PB Only - LiPo Only - Multi Chemistry Dual Port - Multi Chemistry Quad Port - Multi Chemistry Single Port - NiMH and NiCad Only - Composites & Carbon Rod - Carbon Rod Hollow - Carbon Rod Solid - Carbon Strip - Carbon Square Tube - Fiberglass Cloth - Fiberglass Sheet - Covering Films & Tape - Covering Adhesives - Dopes & Finishes - E-Power Everything - BEC Voltage Regulators - Brushless Motors - Astro Flight Brushless - Feigao Brushless Motors - Model Motors Brushless - MT Outrunners - Micro Outrunner Motors - Radical RC Brushless Motors - EMP Brushless Motors - O.S. Motor - GWS Brushless Motors - GWS Brushless Motor Parts - Himax Power In-Runners - Super Tigre - Tower Pro - CD ROM Brushless Motors - Medusa Brushless Motors - Chili Pepper Brushless Mtrs - Great Planes - Himax Outrunners - Himax Gearbox Parts - Himax Motor Parts - Neutronics Motors - Brushed Motors - Direct Drive Brushed Mtrs - Gear Drive Brushed Motors - GWS Motor Sys Parts - Bearings, Shafts & Etc. - Gearbox Frames - Motors W/Pinion - Pinions (the small gears) - Screws/Fasteners - Spur Gears - Ducted Fans & Parts - Ducted Fan Parts - Gearbox - Pinions RRC Gearbox - Mtr Mounts & Sinks 12-28mm - Mtr Mounts & Sinks 29-63mm - Plugs Adapters - Plugs Battery to ESC - Plugs ESC to Motor - Plug Harnesses/Y's/Pigtails - Plug Mount & Arming Switch - Props - APC "E" Props - APC E Series Pushers - APC Multi Rotor Series - APC Slow Fly Props - APC Slow Fly Pusher - Carbon Filled RD Props - Cox Props - Folding APC Style - Folding Yoke Style - GF Props Tractor & Reverse - MT Props Tractor & Reverse - XOAR Electric - Prop Adapters Collet & Etc. - Prop Adapters Set Screw - Prop Saver Adapters - Silicone Wire - Speed Cntrls Brushed Lipo - Speed Cntrls Brushed - Speed Controls Brushless - GWS & Other Brushless Controls - MayTech Brushless Controls - Spinners Adjust Yoke Folding - Spinners Fixed Props - Spinners Yoke Folding - Spinners Folding APC - Tools E-Power Specific - Watt Amp Volt Mahr Meters - Gears - Gift Certificates - Glow & Fuel Power All - After Run Oils - Engines - Engine Mounts - Engine Parts - ASP / LEO / Tigershark - Exhaust Pressure Fittings - Thunder Tiger - Exhaust Couplers - Exhaust Deflectors - Fuel Bottle Parts - Fuel Fittings - Fuel Filters - Fuel Line - Fuel Pumps - Fuel Tank Fitting Kits - Fuel Tanks & Parts - Fuel Valves & Pinches - Fueling Valves & Ports - Glow Plug Drivers - Glow Plug Fittings - Glow Plugs - Ignition Kills - Shaft Nuts - Spark Plugs - Spinner Nuts - Spinners - Starters - Kavan Starter Parts - Power Panels - Pressure Fittings - Props Fuel Engines - APC Sport Props - APC Sport Pusher - Cox Props - Falcon Carbon - Falcon Wood - GEMFAN Wood - Master Airscrew - Xoar Props - Oils - Hardware - Antenna Mounts & Tubes - Ball Bearings - Ball Links - Bellcranks - Body Clips Hitch Pins - Control Horns - Control Line - Cowling Tabs - E-Clips - Engine Shaft Nuts - Firewalls Pre Cut - Fstnrs Wood Wshrs/Shims - Fasteners Nylon Metric - Nuts - Slot Head - Washers - Fasteners Steel SAE - Button Head - Flat Head (Mtr.Mnt.Screws) - Nuts Alloy - Nuts Nylock - Nuts T & Inserts - Servo Mounting Screws - Set Screws - Sheet Metal Screws - Socket Head - Threaded Rod - Washers - Washers Locking - Sets/Assortments SAE - Fasteners Steel Metric - Button Head - Flat Head (Mtr.Mnt.Screws) - Nuts - Nuts Nylock - Nuts T & Insert - Set Screws - Socket Head - Threaded Rod - Washers - Sets/Assortments Metric - Fasteners Nylon SAE - Knurl Head Screws - Nuts - Slot Head Screw - Socket Head Screw - Washers - Hinges - Latches - Line&String - Looming, Zip Ties & Etc - Magnets Neodymium - Metal Rods-Tubes-Wire-Sheet - Aluminum Sheet - Aluminum Tubing - Brass Rod - Brass Sheet - Brass Strip - Brass Tubing - Copper - Music Wire - Steel Sheet - Streamline Tubing - Tin Sheet - Padding - Plastics - Pull Pull Sets & Parts - Pushrod Clevis/Keepers/Etc - .032 Rod Ends - .047 Rod Ends - 1.5mm (.055") Rod Ends - 1mm (.039") Rod Ends - 2-56 (.062" to .072") Rod Ends - 2mm Rod Ends - 3mm Rod Ends - 4-40 Rod Ends - Pushrod Exits - Pushrods - .032 Pushrods - .047 Pushrods - 1.5mm (.055) Pushrods - 1.7mm (.067) Pushrods - 1mm (.039) Pushrods - 2-56 (.062" to .072") Pushrods - 2mm Pushrods - 2.2mm Pushrods - 2.5mm Pushrods - 3mm Pushrods - 4-40 Pushrods - 4mm Pushrods - Rigging and Strut - Rubber Bands - Saddle Tape - Spacers - Tape - Torque Rod Sets & Horns - Tow Line Release - Tubing-Plastic - Weights - Wheel Collars - Wing Joiner - Velcro - Kits - Radical RC E-Kits - RRC Kit Graphics - RRC Kit Parts - Ace Hobby Simple Series - Auto Gyro - Ben Buckle Vintage - Ben Buckle Plan Sets - Dumas Aircraft - Flair & WWI - Glow RC - GWS E-ARF - PARTS, GWS E-ARF - JGRC E-Kits - Flair Parts/Plans/Etc. - Fox Lite E-Kits - Free Flight Accessories - Free Flight Gas - Free Flgt & HL Gliders - Free Flight Rubber - Green Models E-ARF - Millennium E-Kits - Phase 3 Jets - Sailplanes RC - Schulman Aviation Kits - SIG Kits - Slow Sticks & Hop Ups - Factory Slow Stick Parts - Stevens Aero E-Kits - Vintage - West Wings E-Kits - Multi-Rotor Copters - Airframe Kits Radical RC - Heli-Max 1SQ Quad - Kodo - Ominus - Props Carbon Fiber - Props Plastic - ProtoX Quad - Onboard Electronics - 2.4ghz Defibrillators - Antennae Non-US Freq's - Antennae US Freq's - BEC's - Crystals - Electric Flight Pack - Glow Driver Onboard - Lighting System - Modules - Receiver Wraps - Receivers 2.4ghz - Receivers 50 & 53mhz - Receivers 72mhz - Servo Airtronics Digital - Servo Altering Circuits - Servo Gear Lube - Servo Gear Sets - Servo Grommets & Eyelets - Servo Horn Sets - Servo/RX/ESC Mounting - Servos Bluebird/Waypoint - Servos Dymond - Servos Futaba - Servos GWS - Servos HECO - Servos Hitec RCD - Servos Other - Servos Power HD - Switch Failsafe RX - Switches RX Driven - V-Tail/Elevon Mixers - Voltage Monitors - Voltage Regulators - One Of A Kind - Orbit Specialty Items - Rad Wear - Radio Sets - Radio Plugs, Wire, Etc. - Adapters - Airtronics Old - BEC/JST - Buddy Cords - Charge Plug Mounts - Custom Wiring Harnesses - Deans Plugs - Futaba G (old) - Futaba J - Futaba Micro 2.4ghz Plugs - Ignition Plugs - JR-Spektrum-Berg Micro - JR-Spektrum-Hitec-ATX New - Jumpers & Multi Rotor - Keepers (Plug Locks) - Micro Lite Wiring - Mulitplex - Power Box Wiring - Switch Mounts - Switches, Radio and Misc - Tx Pack Connectors - Ultra HD Silicone Wiring - Wire, Servo and Battery - Radio Upgrades & Parts - Any Link - Scale Accessories - Canopy - Cowlings - Edging Ckpit-Canopy&Window - Engine Kits - Landing Gear - Machine Guns - Pilots - Wheel Pants - Wheels - Scooter Hop Ups - Simulator - Software - Tools & Equipment - Balancing - Bits Dremel/Rotary/Moto - Clamps - Covering - Crimping & Bending - Cutting/Stripping/Planing - Drilling - E-Motor Specific - Field Boxes, TX Cases & Totes - Foam Cutting - Heli Tools - Hemostats and Pliers - Hex/Torx/L Wrench - Hinging - Light - Measuring - Misc - Prop Reamers - Sanding Tools - Sandpaper - Saws - Scales, Digital - Screwdrivers - Servo Testers/Programmers - Solder, Pastes & Supplies - Soldering Irons & Jigs - T-Pins - Table Saw Dremel Accessories - Tachometer - Test Stands & Mounts - Threading & Tapping - Workshop Aids - Wrenches - Wheels Gear Axles & Etc. - Axles - Ben Buckle - Collars - Du-Bro Scale & Big - Flair Scale - Gear Blocks Slotted - Gear Straps - Main Gear - Nose Gear - Nose Gear Blocks - Pant Mounts - Retract Fittings & Valves - Retracts - Retro RC Kits - Robart - Steering Arms - Tail Gear - Trexler Pneumatic - Williams Bros - Wood/Foams/Materials - Foam - Sheet Balsa - Z-Rack-N-Stack Hanger - Radical Specials - Custom Customer Charges - Til It's Gone! The collett on Du-Bro's T-Style Tap Handle will securely hold the tap while tapping. Will accommodate 2-56 to 1/4 taps (2-6mm). 1 per package. 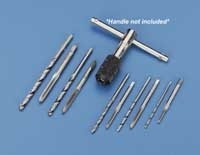 Recommended for Du-Bro's full tap & drill bit sets SAE DUB509 and Metric DUB510. 5 metric taps with matching drills. Taps for bolt sizes 2mm, 2.5mm, 3mm, 4mm & 5mm. Handy indexed storage pouch included. Tap handle shown in photo (DUB633) not included. 5 SAE (American Sizes) taps with matching drills. Taps for bolt sizes 2-56, 4-40, 6-32, 8-32 & 10-32. Handy indexed storage pouch included. Tap handle shown in photo (DUB633) not included. The right drill bit and tap to create 2-56 threads in your models. Useful to thread plywood, steel, Aluminum, plastic and etc. Also can be used to clean up damaged or marred threads. The right drill bit and tap to create 4-40 threads in your models. Useful to thread plywood, steel, Aluminum, plastic and etc. Also can be used to clean up damaged or marred threads. The right drill bit and tap to create 6-32 threads in your models. Useful to thread plywood, steel, Aluminum, plastic and etc. Also can be used to clean up damaged or marred threads. The right drill bit and tap to create 8-32 threads in your models. Useful to thread plywood, steel, Aluminum, plastic and etc. Also can be used to clean up damaged or marred threads. 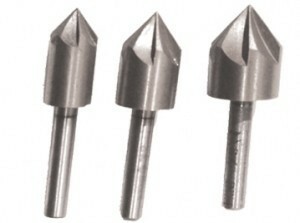 The right drill bit and tap to create 10-32 threads in your models. Useful to thread plywood, steel, Aluminum, plastic and etc. Also can be used to clean up damaged or marred threads. The right drill bit and tap to create 1/4-20 threads in your models. Useful to thread plywood, steel, Aluminum, plastic and etc. Also can be used to clean up damaged or marred threads. The right drill bit and tap to create 2mm threads in your models. Useful to thread plywood, steel, Aluminum, plastic and etc. Also can be used to clean up damaged or marred threads. The right drill bit and tap to create 2.5mm threads in your models. Useful to thread plywood, steel, Aluminum, plastic and etc. Also can be used to clean up damaged or marred threads. The right drill bit and tap to create 3mm threads in your models. Useful to thread plywood, steel, Aluminum, plastic and etc. Also can be used to clean up damaged or marred threads. The right drill bit and tap to create 4mm threads in your models. Useful to thread plywood, steel, Aluminum, plastic and etc. Also can be used to clean up damaged or marred threads. The right drill bit and tap to create 5mm threads in your models. Useful to thread plywood, steel, Aluminum, plastic and etc. Also can be used to clean up damaged or marred threads. Great for deburring the inside of cut off brass/aluminum tubes. 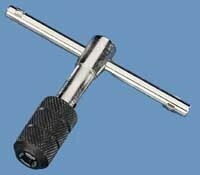 Use to relieve the edge of drilled & threaded holes. 82 degree cut. Important Tip: The area right around the edge of a threaded hole can "ant hill" upwards when a fastener is tightened. This "ant hill" can mean only the very edges of the hole are pressed against the the bottom of the bolt head (or motor lug) and are in contact with the surface. Champfering the edges of the hole a little means the contact patch is moved outward from the hole edge making for more actual contact area. Any ant-hilling occurs inside the chamfer where it cannot interfere. Carbon steel. 1/2", 5/8" and 3/4". K & S Die Handle works with common 13/16" OD dies. 4 locking thumb screws make it easy to use with both round or hex shaped threading dies. Print out our Order Form, fill in the blanks, then mail or fax your order to us! See form for details, thank you! NIMH, Which is better? NiMH or NiCad? How do I charge it? Should I choose 4.8 or 6 volt packs?